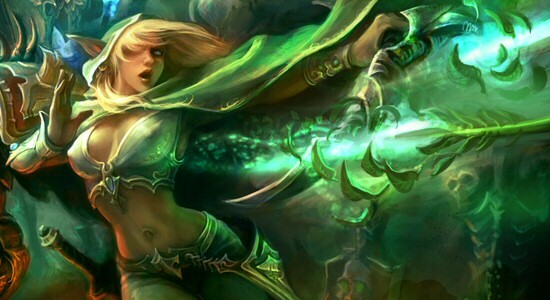 Windrunner is based off Alleria Windrunner in Warcraft 2, the elder sister of the famed Sylvanas Windrunner. Alleria was a High Elf Ranger Captain serving in Quel'Thalas - she took her elf rangers south to join up with the Human Alliance in expelling the Horde from Lordaeron and Silvermoon. The campaign was successful but at the cost of the lives of many of her kin. Some Orcs escaped through the Dark Portal into the Outlands, and Alleria took a contingent of rangers through the Dark Portal in pursuit, intending to end the Orcish threat once and for all. She was never seen again. In DOTA2, the Windrunner is a highly mobile hero with long range attacks and disables with good burst damage and evasion. She has Shackle Shot, which can bind an enemy to a tree or even two enemies together. Powershot fires an arrow with great force over a long distance doing high damage and even cutting through trees. Windrun allows her to sprint and evade all attacks for a brief period, and Focus Fire unleashes a flurry of arrows against a single target. Unusual for an Intelligence hero, she can output significant physical damage with her Focus Fire skill in the late game. Her versatile skill set allows her to be played in nearly all roles, much like Mirana can. In comparison to Mirana, Windrunner has better disables and a stronger early game due to her high base damage, while Mirana has better teamfighting ability and lategame DPS output. Her early game kit combined with high base damage and long range make her a strong laner, able to solo the off-lane or provide support in the safelane. She can even be played mid if necessary. Both her disable and nuke are skill shots, and so aren't 100% reliable. In return, the damage, range and disable are more powerful than usual. Relatively low damage output compared to other supports early game, having only 1 direct damage nuke - she makes up for it with her strong disables and better damage scaling late game with Focus Fire. The search cone for secondary targets behind the primary is about 52 degrees and 500 range. The skill itself can be fired at 800 range, making this one of the most powerful long range disables in the game - if you fire it against a creep and shackle a hero as a secondary target behind it, it has a theoretical range of 1300 and stuns for 3.75 seconds. This skill takes one second to charge up before its fired, but can be released anytime during the channel for reduced damage. Due to legacy coding issues the damage reduction isn't perfectly scaled - the minimum damage is 30% of full damage if fired instantly, linearly scaling upwards to maximum damage if it's held for at least 70% of the channel bar. This means that there is no point channeling the final 0.3 seconds. This legacy issue arose because the trigger to check channel time was coded to start at the point she starts casting the skill - there is a 0.3 second windup cast animation before she starts the channel - and not when when the Powershot channel bar actually appears on the screen. This maybe have been deliberately left in the game as a way for more advanced players to "hold" the Powershot if they were trying to get a long range snipe on a fleeing enemy at an oblique angle. This skill roughly doubles your damage output at all levels by setting your attack speed to max but reducing your damage done. Mathematically, at higher levels, although the damage reduction goes down, this is offset by your hero having more base agility so you benefit less from maxing out your attack speed. Focus Fire is generally ineffective against heroes with good damage block like Tidehunter or if they built a Vanguard or Poor Man's Shield, it would be better for you to save it for another target. If you're building to maximize the potential of this skill, you want to be getting raw damage - attack speed doesn't provide any benefit at all. One level can sometimes be taken early for pushing towers and killing Roshan. (make sure to burn his spell shield first with Shackle Shot) Level 2 and 3 of this skill are probably too expensive to consider using without having access to something like a Sheepstick for mana. Windrunner combines well with heroes with high DPS who can take advantage of her long disables. Tanky heroes are a problem for her to deal with because of her low damage output - they can generally shrug off the damage she dishes out without fear. Phase boots are used for mobility reasons - although Windrun already puts her at maximum movespeed, the phasing ability allowing her to pass through units is invaluable. Also, the extra movespeed over the cap helps offset any slows she might be afflicted with during fights. The +24 damage boost also synergizes well with her aggresive playstyle and Focus Fire. Mekansm is a common item on her, because she makes good use of the armor - as an Intelligence hero her agility gain and thus her armor is pretty poor. Force Staff is very nearly core on her as well, as it helps set up Shackleshot. Both options help the team immensely, and so the choice of whether to build either (or both) depends on the specific circumstance. Her major item is usually a Sheepstick for its deep mana pool, enabling the use of Focus Fire in teamfights. Once Focus Fire comes online your physical DPS becomes a force to be reckoned with, and most Windrunners transition at this point into some physical damage. There aren't really any orbs particularly worth using: Diffusal and Mjollnir offer too much wasted attack speed to be viable. Abyssal Blade would be my weapon of choice - it provides a large amount of attack damage and 10 strength, and doesn't generate any wasted attack speed. The 10% proc chance for stuns is still somewhat useful as most carries by this point will be carrying BKBs, and having the ability to stun them through the BKB is invaluable. She can output 10 shots in 3 seconds, giving her a roughly 65% chance to land the 1.4 second stun in that time frame. It's not atypical to Focus Fire an enemy carry who's activated his BKB, land one stun on him, when he closes the gap you can use Overwhelm on him, and by that time the BKB should have worn off and then you can use Sheep and Shackle. Daedalus provides more damage (roughly 25% more) but I generally prefer the Abyssal anyway for the BKB piercing stuns.